As you enter Volksrust (Dan Pienaar Street) turn left at first robot (Joubert Street), travel down 1 block approx 300 metres and you will find Battlefield Guesthouse on the right hand side. As you enter Volksrust (Laingsnek Street) turn left at third robot/traffic light into Joubert Street. Drive pass two robots/traffic lights and find Battlefield Guesthouse on the left at the next corner. 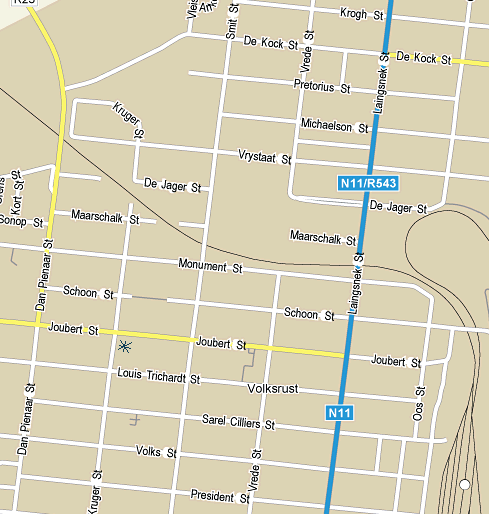 As you enter Volksrust (De Kock Street) turn left at first traffic light into Laingsnek Street. Drive down Laingsnek street and turn right at second traffic light into Joubert Street. Drive through two traffic lights and find Battlefield Guesthouse at the next corner on the left. As you enter Volksrust (Joubert Street), pass first traffic light. Travel down 1 block approx 300 metres and you will find Battlefield Guesthouse on the right hand side.